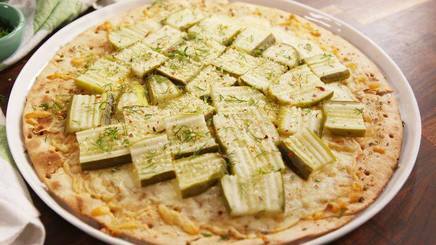 Yup, Pickle Pizza is a thing...and we want it! Perhaps you’ve already had pickles on pizza, it's kind of like a banana pepper or olive. New York’s ‘Rhino Pizza’ officially has a pickle and garlic pizza, and we’re thinking YES YES YES. But, if you are not nearby, you've got to make your own! This recipe from Delish starts with a premade crust, because sometimes we're lazy, and we brush it with a delicious mix of olive oil, garlic, and Italian seasoning. Not so bad, right? Then we blanket it in mozzarella and parm — hey, when has cheese ever done you wrong? This pickle-less pizza gets popped into the oven to get the crust crispy and the cheese melty. When those things have been accomplished, pickles come into the picture. We used sliced and cut them about an inch long — roughly pepperoni sized. Throw them on top and put the pizza back in the oven, this time just for five minutes. Why? Well no one wants ice cold pickles on their pizza! The whole thing get's topped with our favorite pizza finishes — parm and red pepper flakes. To drive the pickle flavors home, we added dill as well. Call us crazy, but we think this combo works. Don't knock it 'til you try it!